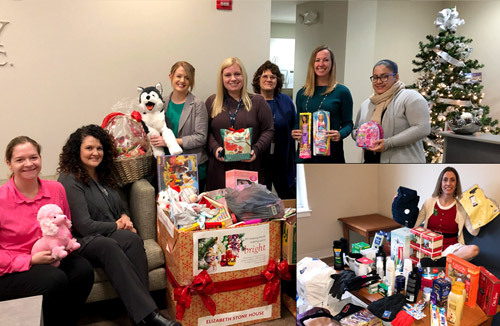 Braintree, MA (December 19, 2018) – Peabody Properties’ Helping Hands Initiative is working to make spirits bright once again this holiday season! This year’s giving campaign helped to support Peabody’s veteran residents by providing them with supplies and toiletries, families at Elizabeth Stone House in Brighton through their annual holiday toy drive, and Boston’s homeless shelters through a winter coat drive. Jacquie Larivee, resident service manager for Peabody Properties’ veterans’ communities, is pictured with the collected supplies, as well as (from left to right) Aria Zayas, Jill Pitts, Lynne Sales, Nicole Bresnahan, Doreen Donovan, Crystal Burns and Victoria Guzman with toys collected for the Elizabeth Stone House.